Now that I've had time to peruse Vogue.com and process all the beauty that is New York Fashion Week, there are a few trends for fall 2011 that can't be denied. Here's who did it best - from the '40s to the '70s, the Southwest to the Argentinian plains. It's the first time I've used PhotoSnack to create fancy-shmancy slideshows, so click through and let me know what you think! My Favorites - these are the looks I can't quantify, the one's that stop me in my tracks. It's just a gut feeling, really. So, tell me what I missed. What were your favorite shows? i really liked the dresses at nyfw. though some shows could have used a bit more variety because it seemed as though all they showed were dresses, i was very impressed with what i saw at vera wang, monique lhuillier, jenny packham et al. i already really liked the continued use of sheers in interesting ways and all the interestingly shaped outerwear! hope that answers your question well. and thanks for the lovely comment on my Full Time Fabulous blog darling! sorry for the belated response, i usually try to get back to the commenters blog much sooner than this but i fell a bit behind with that due to the insanity that was fashion week =P it was lovely meeting you btw and i hope you'll let me know next time your in NY! I really enjoyed this post, since EVERYONE has been posting the same stuff and all i want is a round-up! Really enjoyed these, as i'm a massive colour lover and i do like a bit of 70's - good to see it continuing into the next season! Have a fab weekend doll! those hats in the first photo are interesting, right?! I felt in love with this collection,it's divine!I think there isn't even one piece that I don't like! Hope you have a great weekend Marissa! Pssst maybe I shall go to the next IFB???! Love the 40s roundup - such a beautiful, feminine silhouette. I can't wait until next fall! He did a great collection. 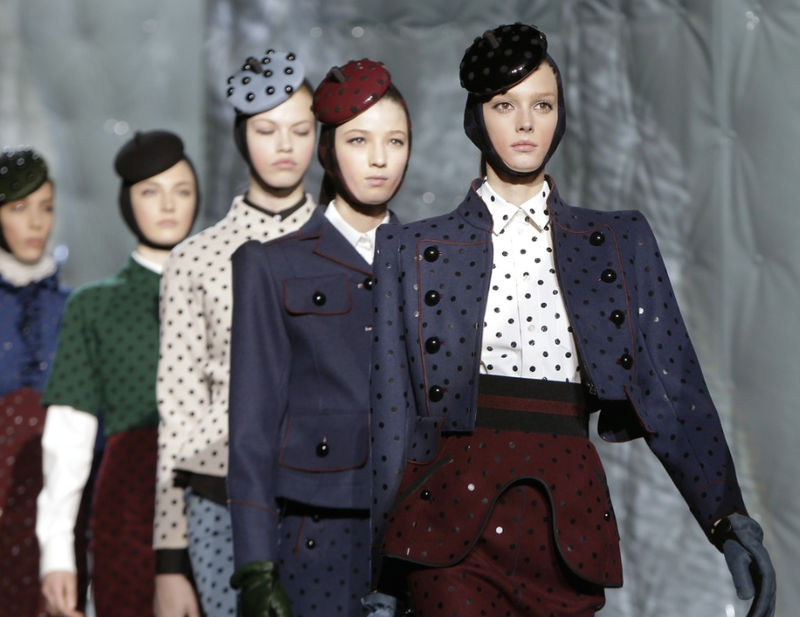 OMG...the opening pics blew me away...I LOVE polka dots, like in a serious, crazy way..those outfits are all so gorgeous...Ive seen those little pillbox hats in all the stores now...really cute!! I have to say that sparkle sucked me in once again. Jenny Packham had it in spades! And Tory Burch's palazzo pants still have me swooning! Thanks everyone! Seems like everyone is loving the '40s influence. I"ll have to go check out the Jenny Packham show. I missed it somehow. Best way to show them that I've seen!! Excellent post! And I really like the photosnack format-I may have to try it out myself! this, I think, was my most favorite runway show of all the Fall 2011 collections. I just loved it. Look at you, all fancy with the photosnack! It looks great and is a fab way to present all these shots without information overload for your readers. i dream all the time to one day being able to make it to one of this!!! thanks for your lovely comment!! this post is great! love the designs! and the hats are so beautiful aswell! i love how varied the trends for fall are! :) i also love that color is incorporated to the wardrobe! You did such a great job. I loved it. I like how you breakdown the trends for us. I love all the variety! I'm really into the southwestern prints right now, so those are some of my faves. But I also love the color blocking going on!